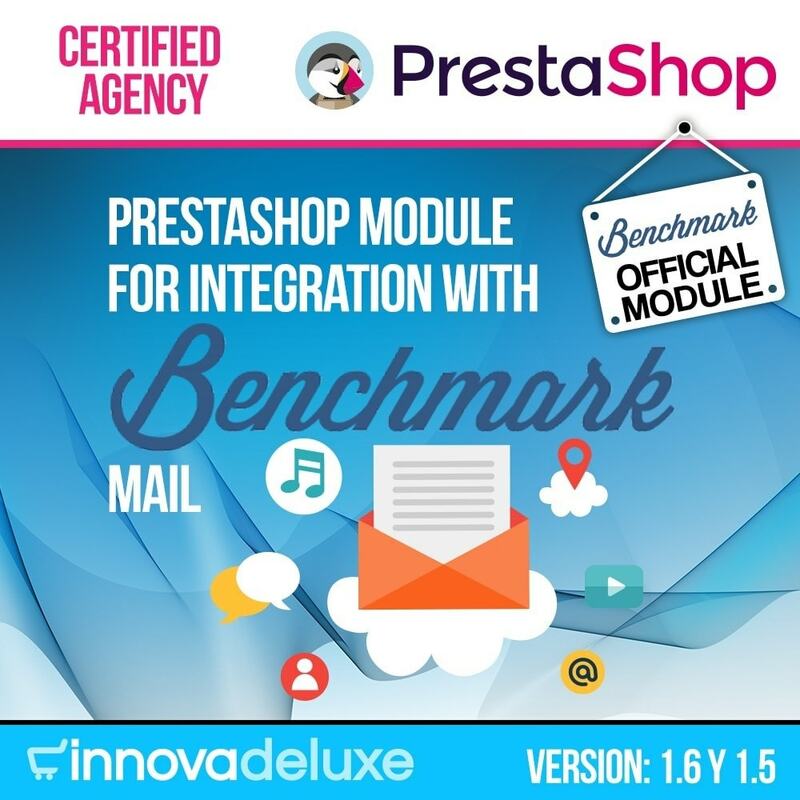 Prestashop module for integrating your online store with the best email marketing automation, organization, and event promotion platform, Benchmark email. 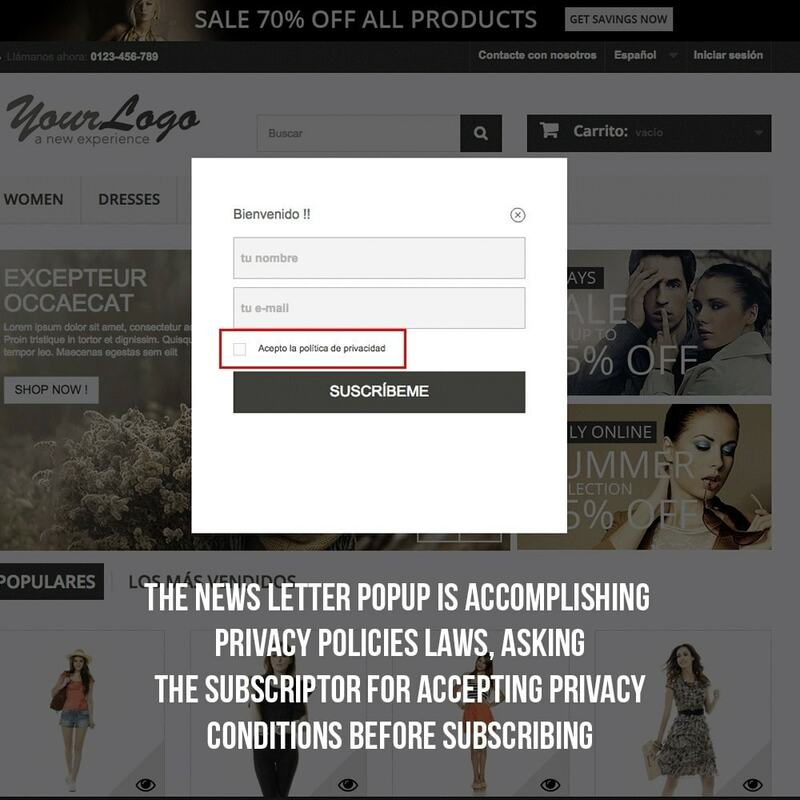 With this module you’ll be able to display a popup in your shop for asking your customers to subscribe to your news and special prices newsletter. 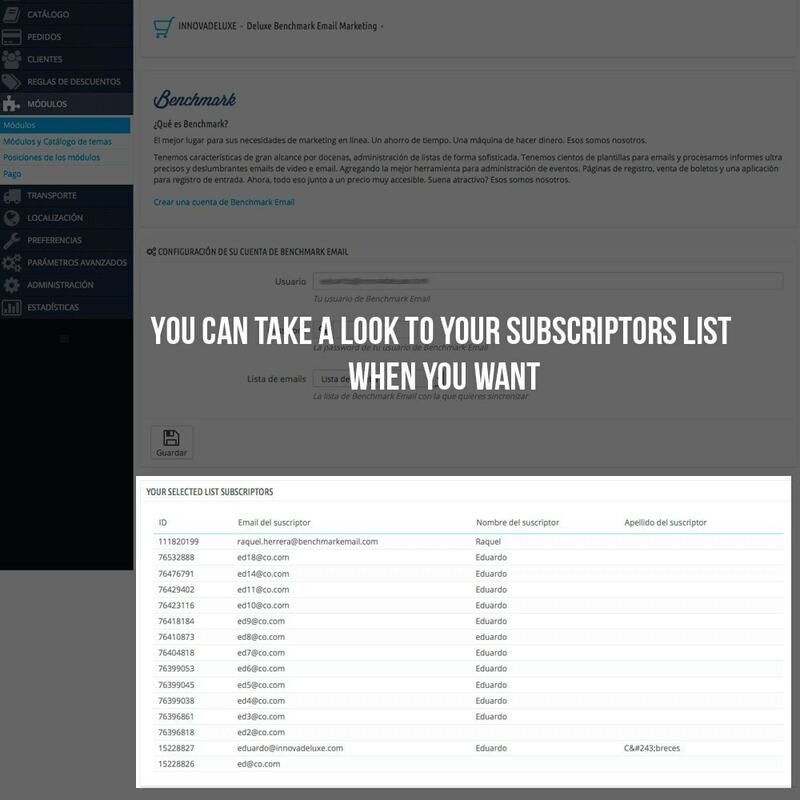 Your subscribed customers list will synchronize with your Benchmark customer account for you to segment your lists and send them mail with special prices or news about your store. Newsletter editor with drag&drop - create emails in a fast and easy way dragging images directly from your computer to your design. Templates - A complete catalogue of impressive email templates available, all of them customizable and responsive. Lists importation and segmentation - With the lists management tool, you’ll be able to have your lists completely ordered. Have your lists segmented in order to improve and focus your mailings. Clean your lists of returned emails and non-active addresses. Make your lists grow, add new contacts or delete them. You’ll have not successful campaigns if you don’t have your lists optimized. Reports - Compare your campaigns results, review responses or know who is forwarding your emails with the powerful and advanced tracking tool. Test different subjects or senders for small groups and then send the best results to all your list. Test a campaign vs. the campaign tester, multiple variables or delivery times. You can test up to two or three variables. Configure your list percent to test and improve your open mails ratio, CTR and more. Inbox verification - The inbox verification allows you to see how a campaign is displayed in different devices (mobile phones, tablets…), web browsers and inboxes. Dedicated IP - Benchmark email has gained reputation with ISP trusted providers in order to ensure are your mails are received. With a high volume plan, you can have own registered IP with the best anti-spam organizations, configured in 24h and installed following all security protocols, including Yahoo!, DomainKeys, ISF registers and customer identification. Sub-accounts - Do you need to manage various sub-accounts from the same master account? This feature allows you to create sub-accounts for your customers with different informations for each one. Polls and surveys - Create impressing email polls using the developed Benchmark email templates available. The responses will be directly in your reports and all of them will be tracked in a fast and intuitive way. Auto Response - Create more than 8 emails at the same time and configure them to be sent in different dates. You can create auto-responses as you need and each one with a specific target for each of your lists. Social Media integration - The social media integration is a an essential part of email marketing. In a simple way, you can add Twitter, Facebook, Linkedin, etc… in your emails, register forms for your fanpage and more. Video Emails - Video email is the new feature for email marketing. It provides you with the tools for you to do it correctly, making your campaigns more efficient and different. Lists cleaning - Manage your lists in a simple way. Make your lists grow by importing old contacts and use a customized register form in your website to get more contacts. Clean the returns, non-active addresses and much more. Real time synchronization with your selected Benchmark list. Popup in your front office for newsletter subscriptions. Customizable popup with a banner to make it more attractive. 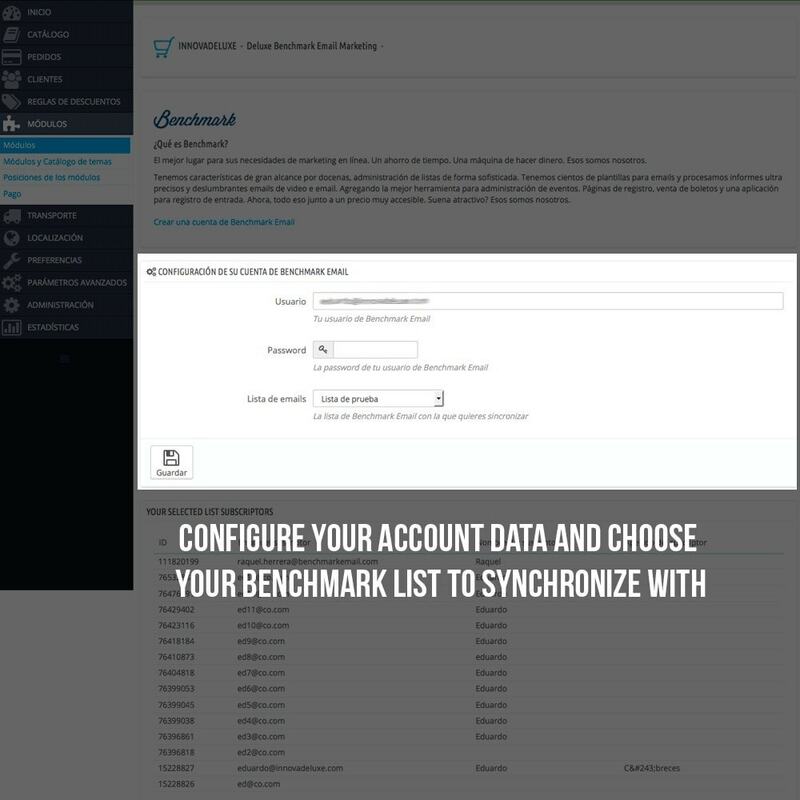 Ease of use, it works automatically, just configure your benchmark account data and that’s all. You can generate a discount voucher for each newsletter subscription. 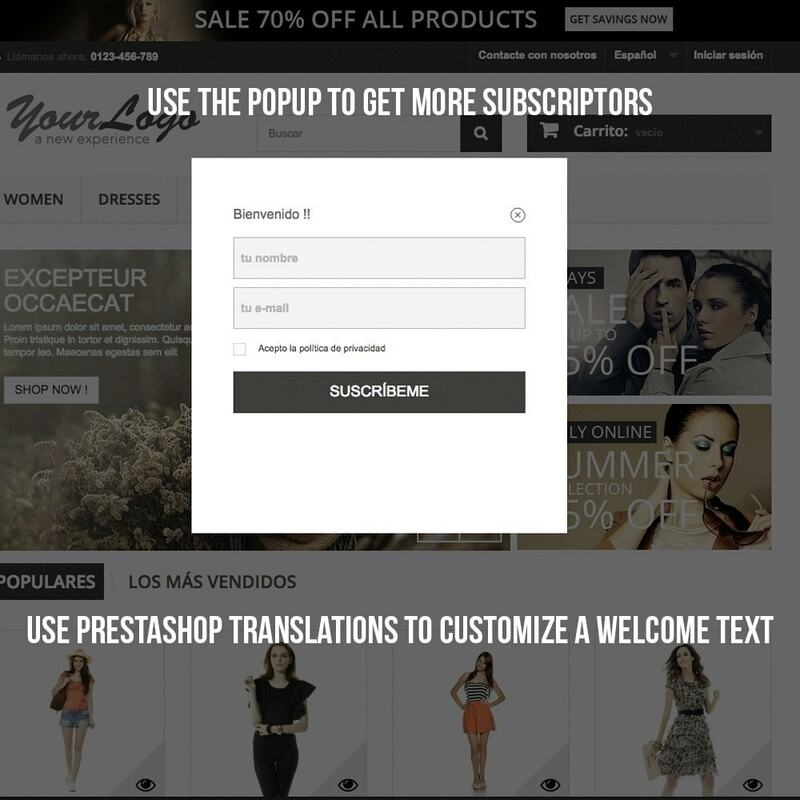 Customizable newsletter title in multiple languages. Field for adding a customized description in your popup. 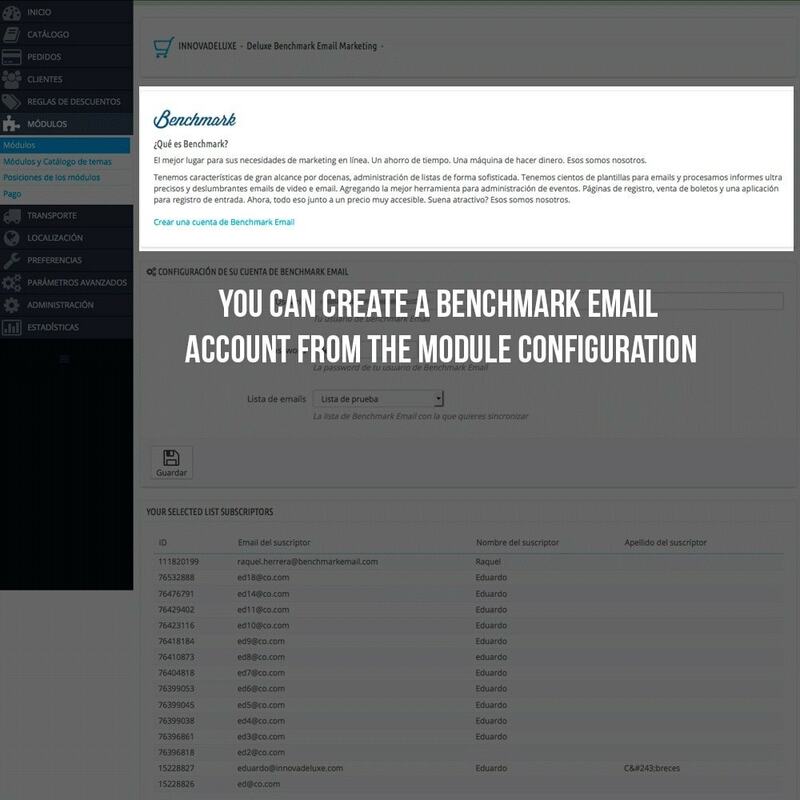 Link in the backfoffice for creating your Benchmark account if you don’t have one yet. 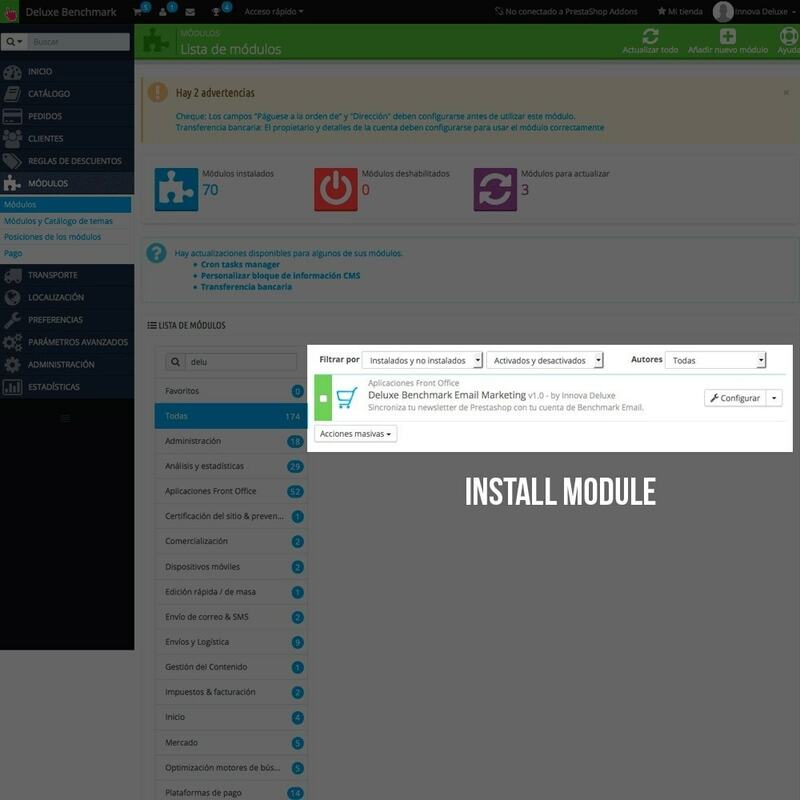 You can configure the time for the popup to be displayed. You’ll be able to move subscriptions to the Benchmark blacklist from the backoffice.